The sleepy town of Karpad in shadow-hunted Nidal has long been overseen by the Boroi family, and until a few weeks ago, the citizens under Baron Stepan Boroi's rule have lived uneventful lives of relative peace. Recently, however, the outbreak of a virulent and fatal disease and a number of mysterious disappearances have left the people of Karpad paranoid and fearful. Even Baron Stepan has been acting strangely, and now the tenuous balance of racial tensions between Karpad's human and fetchling populations stands on the verge of collapsing into total anarchy. Can the PCs uncover the root of Karpad's problems and put an end to the deadly virus, the terrifying disappearances, and the miasma of fear and distrust that threatens to overwhelm the region? 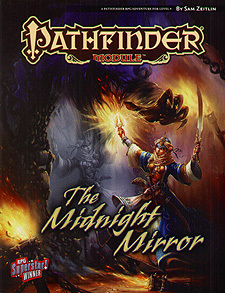 Written by Sam Zeitlin, 2011's winner of Paizo Publishing's annual RPG Superstar contest - in which unpublished authors compete before a panel of celebrity game designers and legions of their peers for the chance to write a Pathfinder Module - The Midnight Mirror takes players from a mysterious investigation into a shadowy demiplane prison and pits them against the evil forces of both darkness and light. The Midnight Mirror is an investigation and horror adventure for 4th-level characters, written for the Pathfinder Roleplaying Game and compatible with the 3.5 edition of the world's oldest RPG. This volume also contains a fully-detailed gazetteer of the town of Karpad and a new magic item that are sure to add depth and flavour to any campaign.